We have new art pieces trickling into the store. As we shared on last week’s blog, we will spotlight each piece that comes in. This piece is a bold abstract with a fun pop of indigo color. This piece is the most modern piece from our collection of art that you will find in the store. 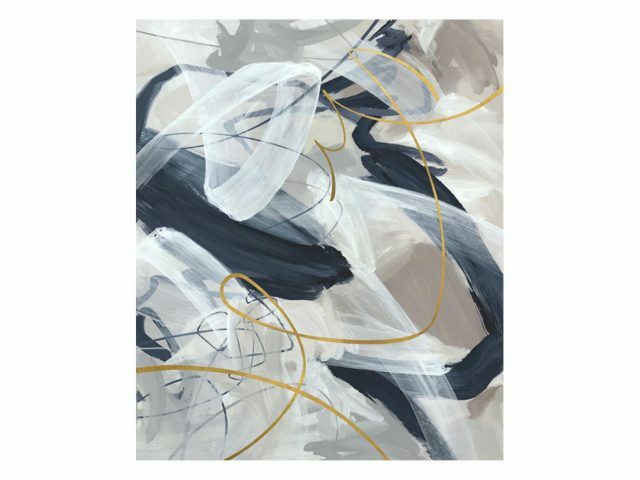 Along with indigo brush strokes, it also has greys, taupes, white and gold mixed into the canvas. The piece in our store is 40 x 48 and sells for $554.99. It can be special ordered in smaller sizes (24 x 29, 30 x 36, and 36 x 43) and larger sizes (47 x 56 and 54 x 65). You can also order any of the sizes listed in variety of frame styles and finishes. You can customize the piece to fit your home. We hope you have a safe holiday weekend. We will be closed on Monday, September 3 for the Labor Day holiday. Before you disconnect for the extended holiday weekend, be sure to keep an eye out for Friday’s blog. It will feature a dramatic ‘Before & After’ of a traditional dining room into a sleek media room.